Pros: These are the best smelling shampoo and conditioner I’ve ever used in my life. They smell sweet and fruity and tropical and heavenly. Also, I love the neon orange font on the bottles–I’m not kidding, it actually makes me excited and happy to have something neon to brighten up my shower. Also, the shampoo lathers much better than any other sulfate-free shampoo I’ve ever used. Cons: I’ve used these products off and on for a few months and have finally come to terms with the fact that they are way too oily for my hair and skin. (I’m so jealous of you ladies who do not have this problem!!!) Even though Bumble and Bumble promises that the oils in these products are “feather-light,” they weigh down my hair in a greasy, unflattering manner, and also cause unsightly breakouts on my hairline and face… eew. Final Say: I want so much to love these products, but I have to advise anyone with fine hair and skin that’s prone to breakouts to steer clear of it. 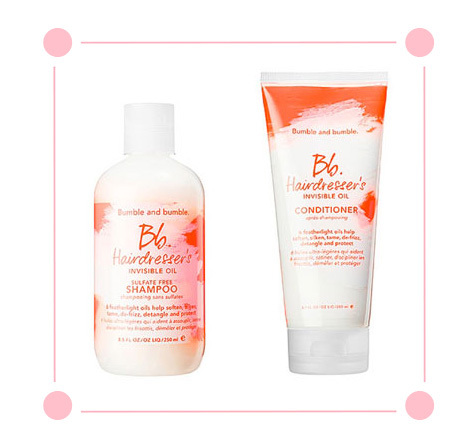 I’m going to start trying out Bumble and Bumble’s other shampoos and conditioners though–I’m determined to find ones that are right for me!